One of the best parts of living in the San Francisco Bay Area is being within a short drive of dozens of scenic parks and open spaces. Local planners, nonprofits, and government officials have protected thousands of acres of wild Northern California landscapes and built hundreds of miles of scenic hiking trails through Santa Clara and San Mateo Counties. One problem for hikers, though, is that so many different organizations manage these parks and public spaces and it can be hard to figure out where to go. To that end, we've compiled a list of all the public agencies that operate hiking trails in San Jose and Silicon Valley. The City of San Jose operates one of the nation's largest urban trail networks with 56 miles currently developed for public use, and a goal of growing to 100 total miles by 2022. Trails range from flat, downtown commuter trails like the Guadalupe River and Coyote Creek, to rural and mountain trails like those in Alum Rock Park and the Silver Creek Valley Trail. Unfortunately, the city's trail website is difficult to navigate and there is no good map of the city's trails. All trails allow dogs, except those in Alum Rock Park. The County of Santa Clara's regional park system covers both urban and mountain parks with a diverse mix of trails, lakes, streams, and open space environments. It is one of the most diverse recreational areas in all of California. The agency currently operates 29 county parks and nearly 46,000 acres of protected space. The county has an online tool called "Parkfinder," that lets you search the system by keyword, location, or type of activity. The tool even allows you to specify criteria like "dogs on leash" to find out which trails allow pets. San Mateo County operates 21 parks with dozens of divers trails across the county from the San Francisco Bay to the Pacific Coast. While the County's website doesn't have a physical search form, you can select categories in the left sidebar to limit the list by activity, location, or trail usage. Only two San Mateo county hiking trails allow dogs. The Midpeninsula Regional Open Space District operates 24 protected open space preserves in San Mateo County and the Santa Cruz Mountains. Open space preserves are minimally developed public spaces, with fewer facilities and recreational services than city or county parks. They offer great places to hike if you really want to get away from the city. The Santa Clara Valley Open Space Authority operates three open space preserves in Santa Clara County. 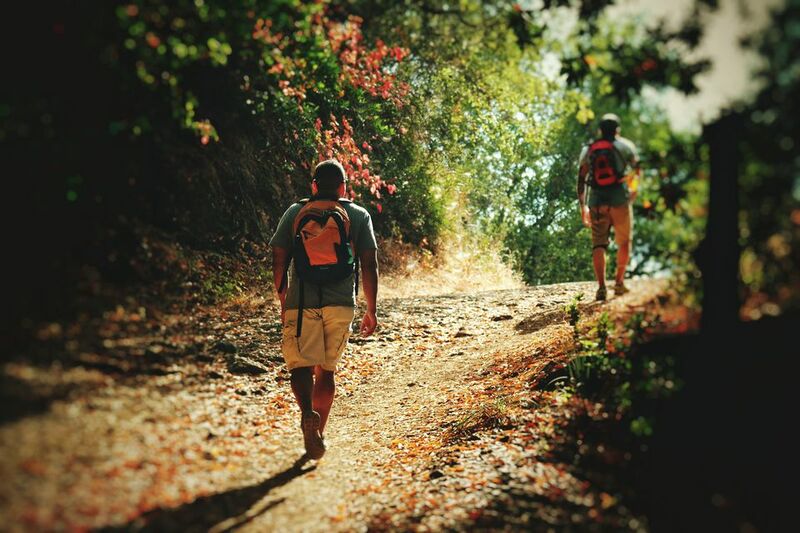 The website doesn't allow you to search the trails, but you can view individual trail maps: Rancho Cañada Del Oro, Sierra Vista, and the Coyote Valley Open Space Preserve. Dogs are prohibited on all Open Space Authority trails. The City of Palo Alto operates four open space preserve areas within the city. You can get a printable guide and map of these preserves. The State of California operates two parks in Santa Clara County and 15 parks and beaches in San Mateo County. You can use the website's "Find a Park" tool to identify state parks in your area.